Medi-Cal – California’s Medicaid program – provides free or reduced-cost health coverage for low income individuals and families. Medi-Cal increases patients’ access to important healthcare services, such as doctor visits, immunizations, hospital care, and the 10 essential health benefits. Medi-Cal primarily serves individuals and families who are below 138% of the Federal Poverty Level. Others who are eligible for Medi-Cal include (but are not limited to): newborns, foster care youth, pregnant women, persons with disabilities, and seniors. 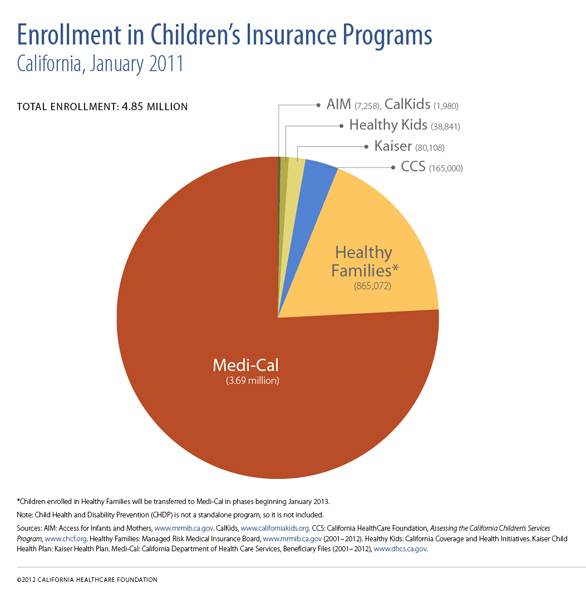 How many children are in Medi-Cal? Among our 8 member hospitals, Medi-Cal funds about 62% of inpatient and outpatient visits. Unfortunately, Medi-Cal does not usually reimburse hospitals enough to cover the basic costs of providing care. This is a major concern for children’s hospitals, which provide critical – but costly – care for children with serious conditions. Although Medi-Cal does not sufficiently cover costs, it is still an important payer for children’s hospitals. Governor Jerry Brown recently announced a budget deal that will expand Medi-Cal coverage for undocumented immigrant children. Under this expansion, which is scheduled to begin in May 2016, roughly 170,000 youth will become covered.2 Although this will cost the state $132 million annually to implement, the benefits are likely to outweigh the costs. For example, there will be significant financial savings from costly – and preventable – hospitalizations in this population. Moreover, expanding Medi-Cal to all children provides them a chance to live healthier, happier, and more productive lives.